Believe it or not, there's another Warhammer 40,000 game in the works. In development at Incredible Adventures of Van Helsing studio NeocoreGames, Warhammer 40,000: Inquisitor - Martyr is a "persistent sandbox action-RPG" that will set players off "into a grim and secret war among the stars as the agents of the ever-vigilant Inquisition." The studio didn't reveal much in the way of specifics about the game, although it did say that the sandbox mode will kick in after the core campaign is over. "The story continues in a colossal sandboxed game set in the same secluded sector of this vast universe," it explained. " This persistent setting grants years of constant entertainment, gradual development and a continuous flow of content that enriches the Action-RPG gameplay." 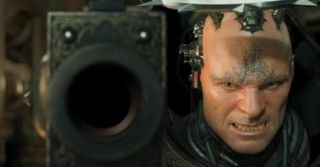 "There’s a reason why we chose the world of Warhammer 40,000," NeocoreGames Producer Zoltán Pozsonyi said in a statement. "It’s intense, brutal, visceral—a perfect material for an action RPG." It's also very well-trodden territory. There's been a slew of Warhammer 40K games announced or released recently, including, in no particular order, Regicide, Dark Nexus Arena, Space Hulk: Deathwing, and Battlefleet Gothic: Armada. But as Games Workshop Head of Licensing John Gillard said, "A Warhammer 40,000 action RPG has been notably absent from our portfolio of videogames so far," and so here we are. There's a (very) brief teaser posted on Neocore's Inquisitor - Martyr site that promises cleansing through pain and fire, in an appropriately deep and rumbly voice. Warhammer 40,000: Martyr - Inquisitor is expected to come out in 2016.